Owner Darragh MacAnthony will sell Peterborough United if promotion to the Championship isn’t achieved in the next 18 months. MacAnthony took to Twitter today (February 14) to make his pledge after critics of his policy regarding transfer started moaning publicly following yesterday’s 4-0 League One defeat at home to Bradford City. MacAnthony does not expect to have to honour his promise. 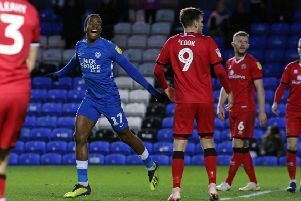 He remains confident that Posh will return to the Championship by the end of next season at the latest. Just two weeks ago MacAnthony was talking about a three-year plan to take Posh into the Premier League. Posh dropped to 10th in League One yesterday following their biggest league defeat for almost six years. They are six points off the play-off places, a gap that could grow before they return to action at Millwall next Saturday (February 20). MacAnthony used his Twitter account to explain: “We took the plaudits for everything that was good about our team/club on Wednesday night (February 10, a defeat to Premier League West Brom in the FA Cup on penalties) so we shall take deserved criticism for yesterday. “We hit a brick wall in many ways. No excuse, but it happened. Apologies for that and now it’s up to us to get the credit/plaudits back quickly. “Yesterday has brought out usual critics on club policy and the way we do things under me etc. No problems with opinions as part of the game etc. “But I’m happy to put money where my mouth is and back policy, and what we do, by stating honestly/categorically that should Posh not win promotion inside the next 18 months (which I have no doubt we will) then I’ll stop my policy and find another owner with a different policy/approach. “No owner should be satisfied with averageness and should always strive for promotion/success. It’s what drives me. “My policy isn’t about personal financial gain, it’s about allowing a small club to do outstanding things in an entertaining manner while being financially responsible on behalf of the fans/staff/players of the organisation. “So there it is, we are on the clock. 18 months, promotion and hopefully buy the stadium back for the club or it’s time for different owners/policy/approach. The club accounts confirm on an annual basis how reliant the club is on MacAnthony’s financial backing. Posh owe MacAnthony close to £6 million in loans. MacAnthony has come under fire form some supporters for selling their best players too regularly. Top scorer Conor Washington was sold to Championship side QPR in January for £2.5 million. Posh have scored two goals in four League One games since he left.